This is a notebook I altered some time ago for a forum swap. 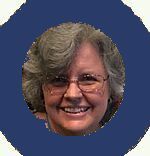 The only stipulation was you HAD to use the initial or name of the person you were creating it for. 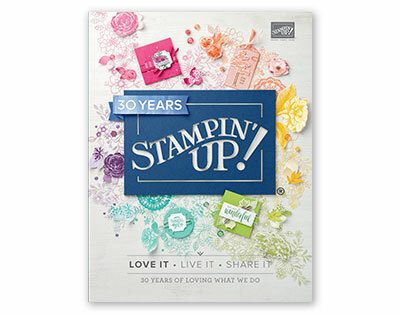 Mine was made using distress inks, stamps & embossing. 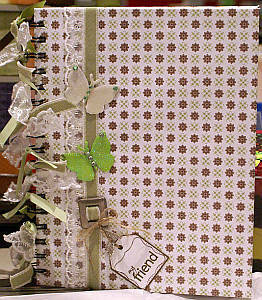 Paula I really appreciate you showing your altered notebook :) It's beautiful and I love your work! It would be so special to have a handmade notebook with your own initial on it. I think the person you made this for would treasure it. It would be truly a unique and thoughtful gift. Those are lovely stamped images you used and the distress inks always fascinate me with the different effects you can get. How did you make the background behind the girl? I need help on how to personalise the cover of a binder. folders. I made one of these recently (pictured above) and I really like using it. add gems, glitter, punched shapes, beads, brads, paper flowers, charms and other pretties. You might want to cover the finished book with plastic, acetate, or some other sealant like gesso or even tampin' Dimensional to protect it, though I chose not to do that on my sample this time. To make a fashion statement or if you would like a grungier look, cover your book with faux leather fabric, hessian or another fabric you like. Use inks to add colour to the edges and make it look grungier. Add buttons, leather thongs, shoelaces etc to decorate the cover. also stamp on fabric with Craft ink. 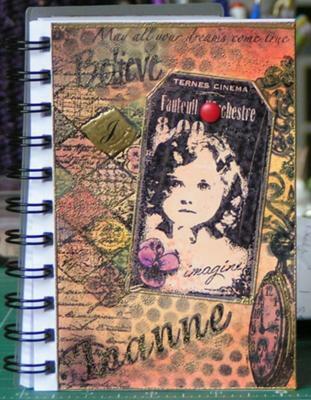 Use felt to decorate with photos, paper and embellishments to create and personalise your next diary! Oh, what a beautifully altered journal cover! I just love it, Tanyah. I love the colours you have chosen and the felt adds so much warmth. 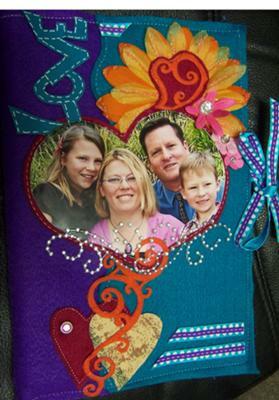 You have showcased your lovely family photo perfectly and made a very special treasure of an altered book! I'm a big fan of the crystal bling and ribbon you have used, too. Thank you so much for allowing us to see your work! This was made based on the first altered book I made but it was for a friend who was leaving to start a new job. I thought she might need a little book to jot things in. As she is a lover of purples & fuchsia pinks along with lots of black, it was easy to colour my background & overstamp in black. I then added black embossing powder to it for detail. I used my favourite image to finish. 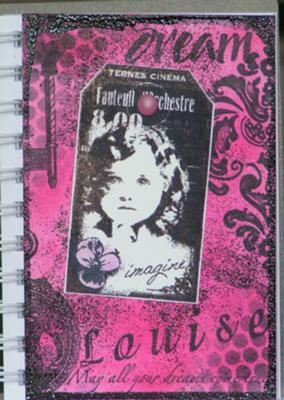 Oh Paula I am so glad you uploaded another of your beautiful altered notebooks! Your friend must have felt very blessed when you gave it to her. It is very different from the first one you showed us and I love the different background and colours you used. The stamp is gorgeous and the flourishes and words really set it off well. 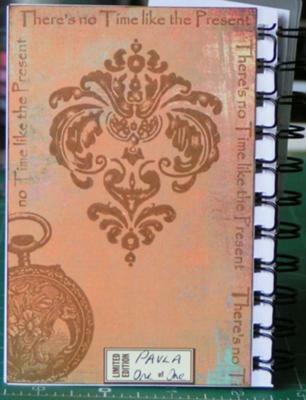 Your friend will no doubt be reminded of your friendship each time she uses her notebook! You take any old or ruined hardback book, decoupage, photo, poem or whatever you want to showcase. Using the decoupage, completely cover the book opening it in the center, and curl edges up for decoration before decoupaging. Antique the edges of the open pages with plain brown eye shadow or ink then decoupage it open. You can even paint pages or leave them as they are for a more unique look. Add a satin bookmark as if book is just left open and put onto a book stand and enjoy it. It also makes a very special gift. You can put a friend's wedding invitation on one side and their wedding photo on the other side. You can also decorate it with dried flowers from their ceremony. Let your imagination just grow. You'll love the finished product. Growing up we had something like this with a picture of Jesus on one side and a Bible passage on the other. The page edges were painted gold and I thought of all the beautiful things you could make. Give a special gift to a friend who just had a baby. The ideas are endless and fairly inexpensive. You can pick up a used book at a yard sale for a quarter and use things around your house. If you use dried flowers or anything that may not stand up to time carefully brush decoupage or I've used clear nail polish too. I hope you all enjoy this idea and give someone special a perfect handmade gift from your heart. Oh, Tina, I wish we had a photo of your work. You describe it so beautifully but I would love to see it too! Thank you for taking the time to tell us about such lovely altered art ideas. I do like the thought of making a special gift for someone after a special event has occurred. flower pot as a gift, too. 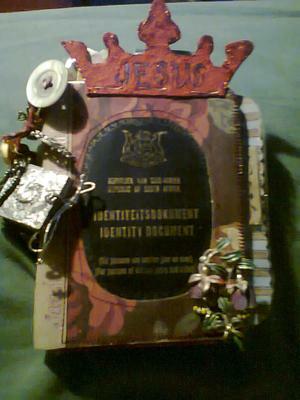 I discovered an old identity book from the 70's(ahem) and decided to turn it into a spiritual journey. It just seems to grow. It is nearly filled. I can't wait to start the old passport I found! The rest of the pages can be seen at Bushbabies handmade journals on Facebook. Had tremendous satisfaction from this project. I would love to be able to flip through the book. It would be fascinating.